Phoenix is finally catching up to the rest of the country in options for vegetarian and gluten-free food. One in particular is Pomegranate Cafe in downtown Ahwatukee, just south of Phoenix. In a nondescript strip mall you can find pure vegetarian heaven! What makes it so wonderful is not only the vegetarian choices, but most of them are raw, making just about everything gluten-free. This adorable little cafe is run by mom and daughter duo, Marlene and Cassie Tolman. I brought my daughter, a friend of hers and my mom on a little trek to Pomegranate on our way to IKEA (another favorite hangout!) We didn’t want to leave the restaurant. Not only is the food wonderful, but the service and atmosphere are relaxed and perfect. The staff are helpful and truly educated on gluten-free options, which is a refreshing change in the area. So, on to the food. 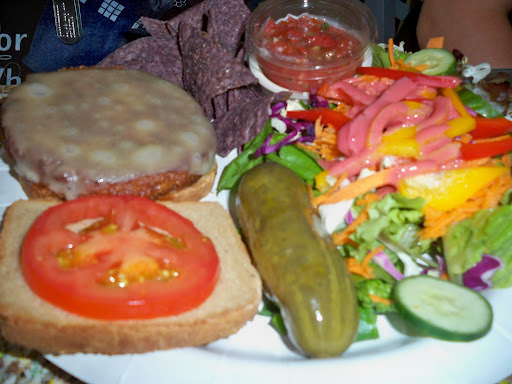 The girls had the Garden Burger, the cafe’s own tofu veggie burger on gluten-free bread, which is an option along with the spelt bun. The girls split the burger and as you can see there was plenty for both of them. I tried the burger and it was tasty, tangy and firm. Daughter thought it even tasted a little like the veggie chicken patties we’ve had in the past. It had that kind of mild taste to it. I liked it and would definitely order one in the future. The pickle was crisp and tart and the salad was just enough to satisfy both girls. Daughter and her friend have already asked to go back for another. The burger comes with a choice of cheddar or vegan cheese. Kids chose the cheddar. 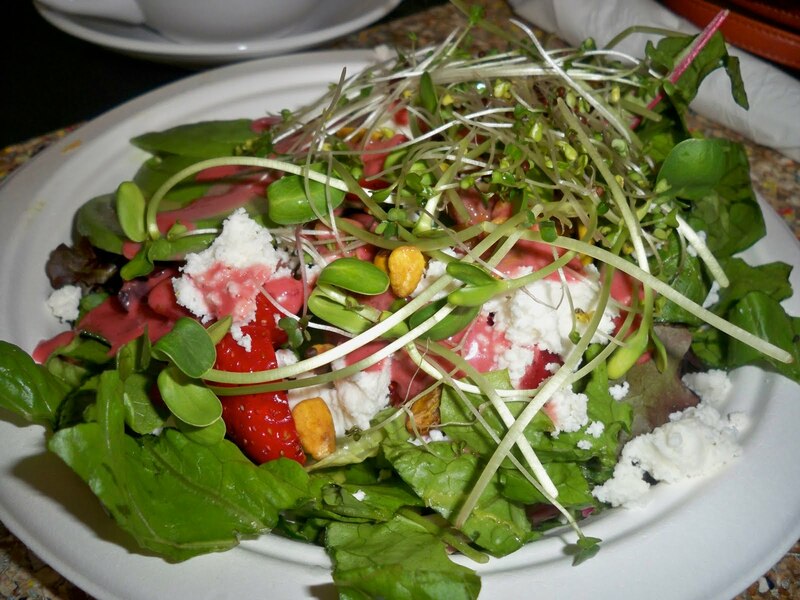 Mom ordered the Strawberry Fields Salad, chock full of fresh goat cheese, pistachios and strawberries. Just the right size for lunch with a tangy, tart pomegranate vinaigrette. I love the crunchy sprouts and avocado, giving the salad an added crunch and flavor. But the most amazing and wonderful dish, shared by all and wowed over by all, was the Arizona Roll, a completely raw treat that I can’t stop thinking about. 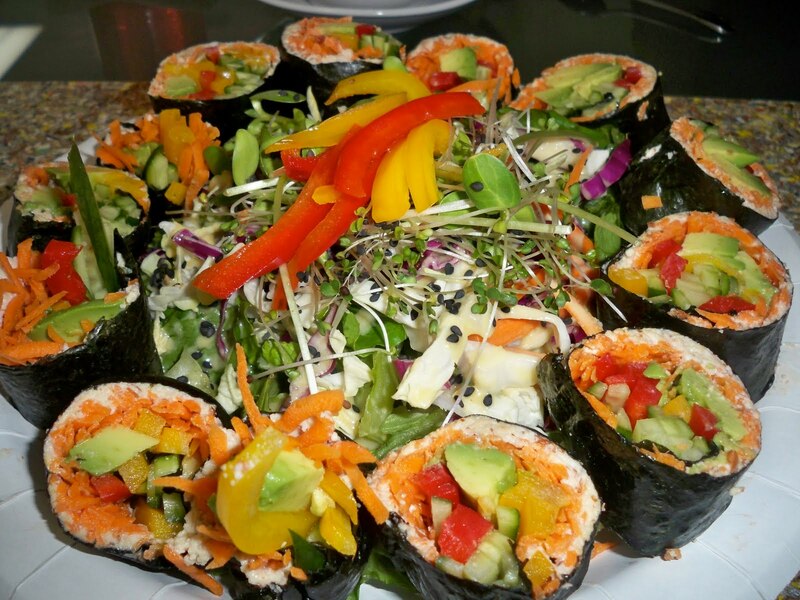 It starts off with nori seaweed stuffed with a sweet and nutty almond spread and a rainbow of veggies including carrots, peppers, and avocado. There is a shoyu sauce for dipping and I recommend you don’t miss it. It’s also served with a cabbage salad with miso dressing. There was so much that we all had a chance to try it and the kids went back for seconds. I was full from what I had, along with the wonderful miso salad. I highly recommend you try this, and bring a friend. It’s a great experience to try something that is so wonderful and good for you. But we weren’t done yet. 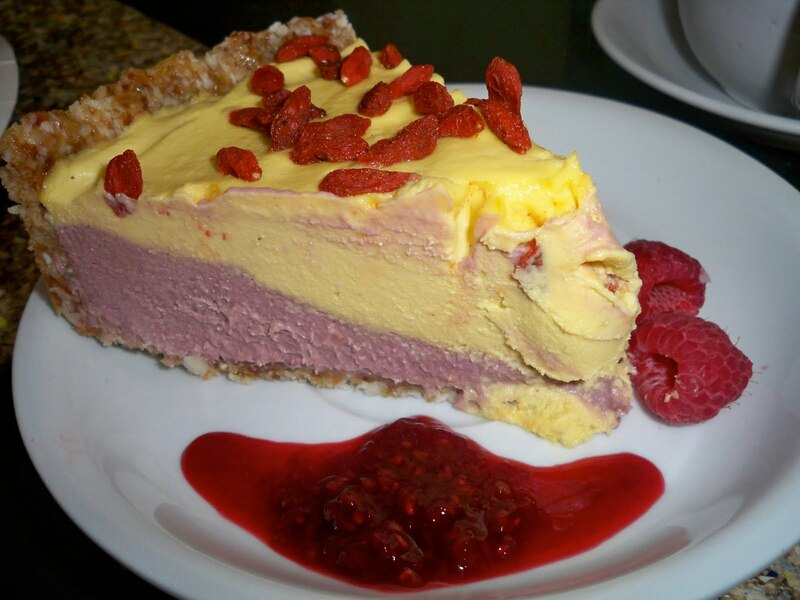 One of Pomegranate’s specialties is the raw pie. I’ve had a the Super Berry pie before, but this time we had the chance to have both the Super Berry and the Pineapple Cheesecake. But don’t let the names fool you, they are both made from completely raw ingredients and have no dairy or gluten in them. The crust is a fantastic combo of just macadamia nuts, coconut and dates. I don’t know how it’s done, but those three ingredients create the most tremendous of tastes. 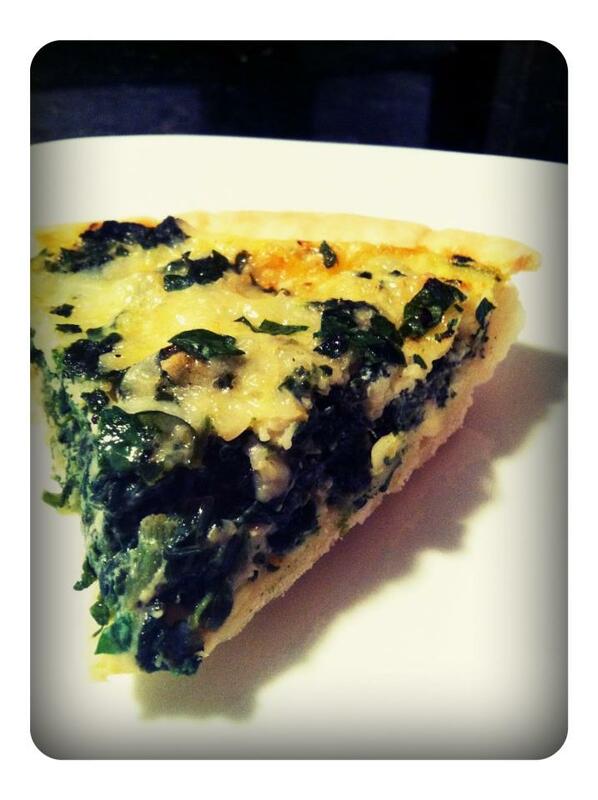 Daughter kept eating the crust and saying, “Why don’t you make this?” Hmmm, why don’t I? 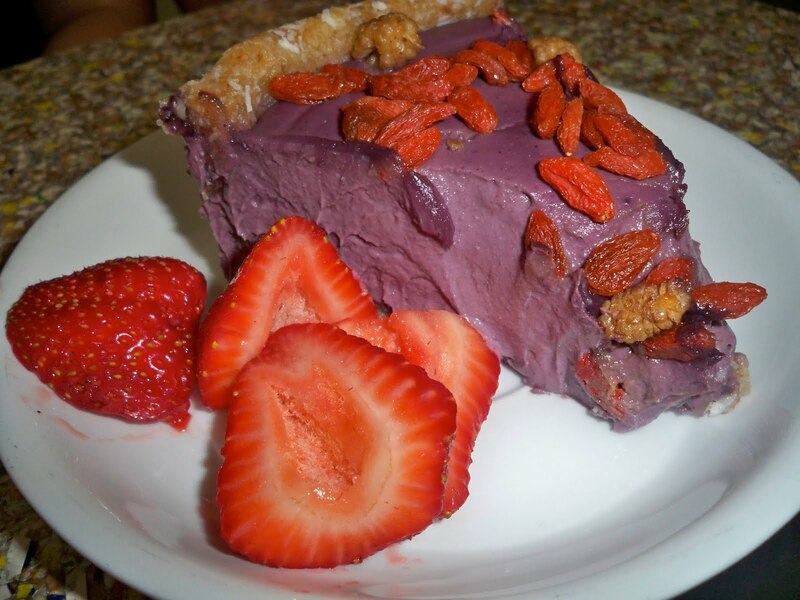 The Super Berry pie is made simply by soaking raw cashews and then blending them to a smooth creamy texture. Add to that acai, blueberries, goji berries, coconut oil, agave, pomegranate juice and orange juice and you have a beautiful, purple berry surprise of a pie. It’s amazing how creamy just cashews can be. No sugar, now high fructose corn syrup, etc. Just berry goodness packed in each tangy bite. The pineapple cheesecake uses the same base and crust as the pie above, but uses a top layer of pineapple and mango, giving it a wonderful, tart bite to it. Out of both, the girls liked the pineapple better, although I suspect they also liked the fact that it was half frozen and that made it more like ice cream to them. Either way, I think I would choose it also for it’s tart, fresh pineapple flavor. With True Food, Pomegranate Cafe and now Nourish, Phoenix has finally gotten a blip on the radar of good, healthy food. There are finally a few places for those of us who want to eat out, yet not give up our quest to eat healthy. I’m dining at Nourish tonight and I’ll let you all know how it went. I can’t wait! Of course, it’s not the healthiest pie out there. 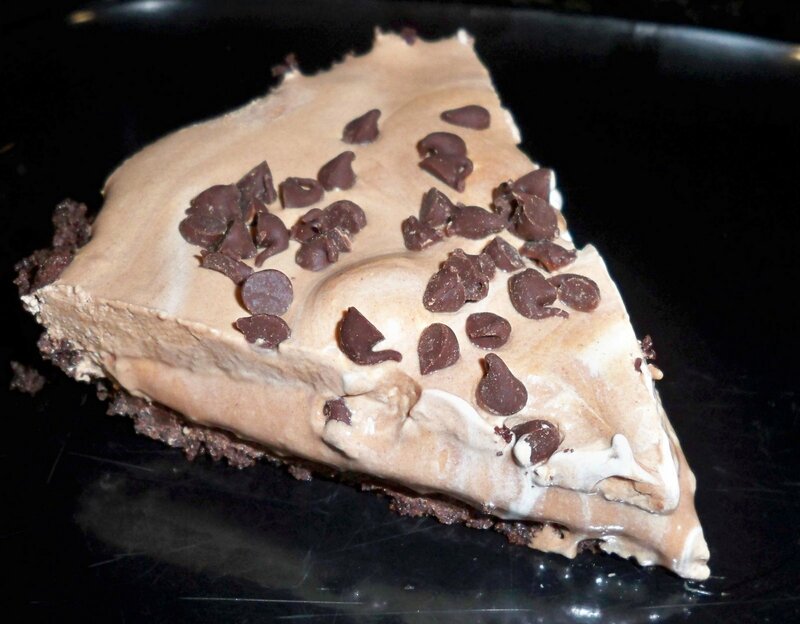 Yes, it’s made with tofu, dear chef, but it’s also made with chocolate chips and Cool Whip. But if you weigh it all out, it’s still a pie with tons of protein, so we won’t complain. It’s also a pie with lots of taste, trust me. I found the recipe many years ago on a tofu package (Mori-Nu, I believe) and of course modified it to my own way of eating. I didn’t change it that much, the original recipe was pretty good, but of course everything has to be modified for those of us going GF. The main change was the crust. Instead of chocolate or graham cracker crust, I made my own using Pamela’s cookies and butter. Yum. Try it and see what you think. This recipe made a lot of pies, I would suggest cutting it in half the first time you make it. I made two mini pies, two small pies and four frozen pops. The bag of cookies was enough for all, although I used some of the ginger snaps for one pie just to change it up a little. 1. Grind up cookies in food processor, or place them in a ziplock and pound them. 2. Add about 1/4 cup melted butter to cookie crumbs. Mix thoroughly. 3. Pour crumbs into sprayed pie pans and spread along the bottom and up along the sides as much as possible. 4. Set pie crusts in the freezer while you make the pie. 5. Put tofu in blender and blend until smooth. 6. Melt chocolate in microwave for about 45 – 60 seconds. Stir well. 7. Add melted chocolate, agave and vanilla to tofu and blend. 10. Place in freezer for about an hour. These cookies are wonderful. They make a great crust for any pie. 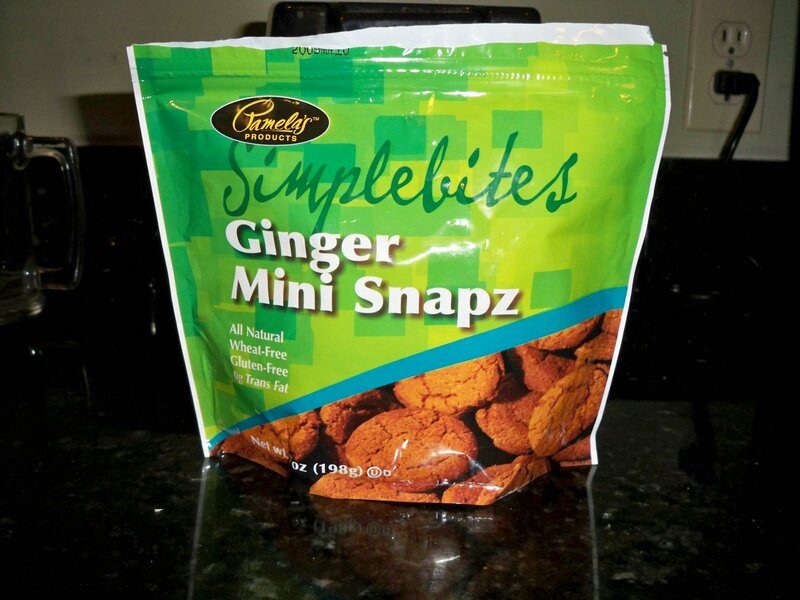 I recommend the ginger snaps for a GF cheesecake, yummy. 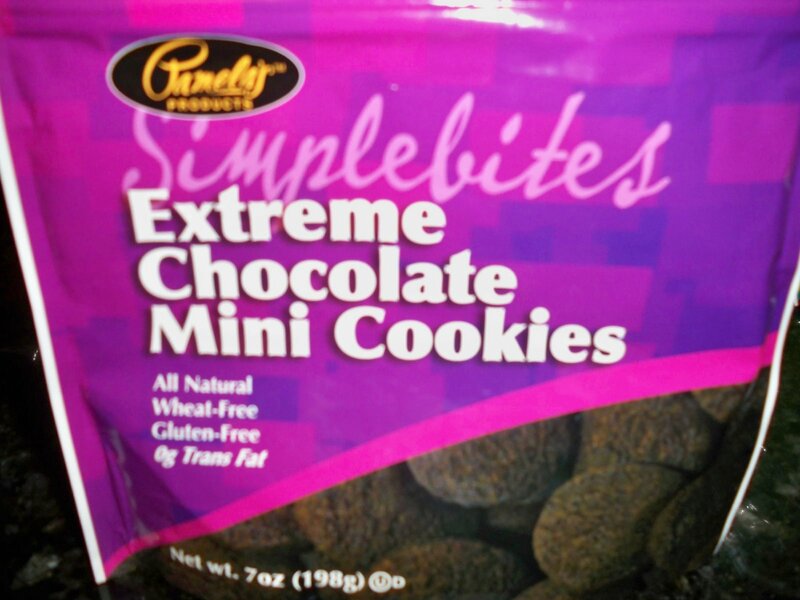 Pamela’s also makes a great chocolate chip mini cookie that make a great snack.